Written in Carl Beech's own inimitable style, The Manual: New Christians offers 30 days of undated Bible reading notes, introducing readers to the basic tenets of their new belief and presenting foundational truths for those starting out on their Christian journey. By encouraging people to engage with Scripture, The Manual: New Christians will help readers to grow a relationship with God. 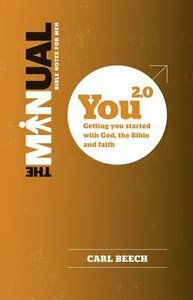 About "You 2.0: Getting You Started With God, the Bible and Faith (The Manual Series)"